151 years ago this month, a vicious, violent attack on the United Stated government took place: President Abraham Lincoln was assassinated. But there was a second assassination attempt that dreadful evening, which fewer people know about. It was aimed at Secretary of State William H. Seward and it was witnessed by his terrified daughter. 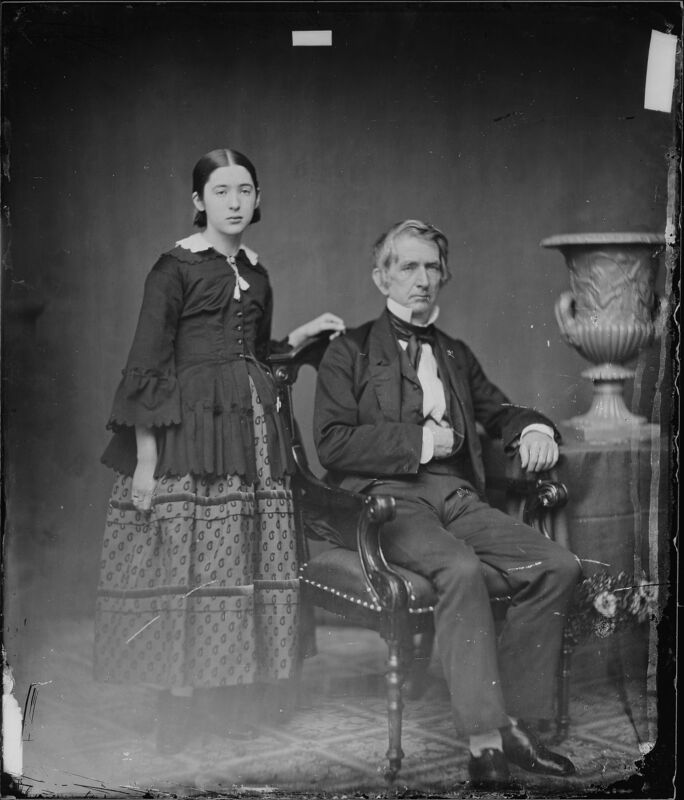 Fanny Seward with her father, William H. Seward, United States Secretary of State. On the evening of April 14, 1865, while Abraham and Mary Todd Lincoln were on their way to Ford’s Theatre to see the play “Our American Cousin,” twenty-one year old Fanny Seward was sitting at the bedside of her ailing father, William H. Seward, the United States Secretary of State. Three days earlier, on his way home, Seward sat outside on his horse-drawn coach, next to the driver, smoking a cigar. For some reason, the coach door flew open and when the driver stopped the coach to close the door, the horse became agitated, upsetting the carriage. Seward was thrown off the carriage to the ground, breaking his jaw and his right arm. Now, he was home resting, with his daughter to take care of him, while he wore an uncomfortable metal jaw brace – a metal brace that would eventually save his life. 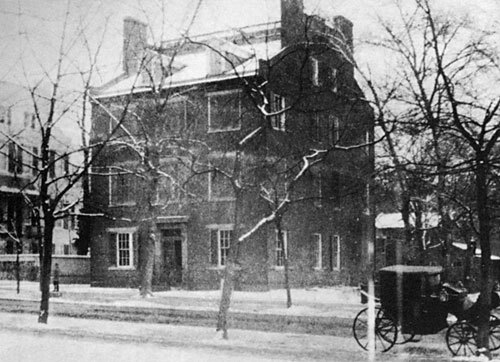 The William Seward home in Washington D.C.
As Fanny sat quietly with her father, making sure he was comfortable, she heard a knock downstairs at the front door. She didn’t concern herself with answering the door since there was a butler on duty, along with her father’s bodyguard, an army nurse and two of her brothers, Augustus and Frederick. What Fanny couldn’t see was the arrival of a young man, Lewis Powell, who claimed to be carrying medicine for the ailing Seward. He was lying. Once the butler opened the front door, Powell pushed him aside and rushed up the stairway toward Seward’s bedroom, with a pistol and knife in his hands. 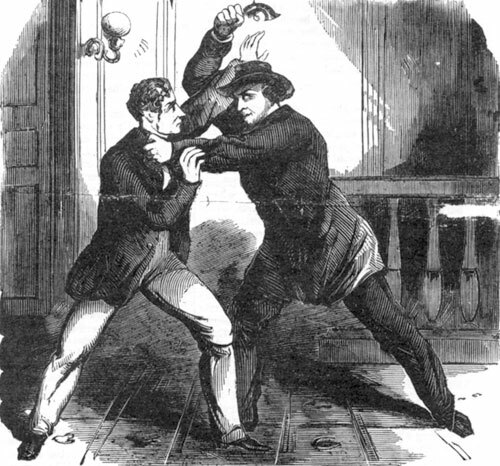 Fight between Lewis Powell, the would be assassin of Seward and Seward’s son, Frederick. Newspaper illustration. Frederick Seward, the Secretary’s son, stopped Powell on the stairway. Powell tried to shoot Frederick, but the gun misfired. Then the frustrated Powell beat Frederick over the head with the barrel of the gun. It was at this point that Fanny opened the bedroom door to see what was happening. She immediately regretted her action as Powell, Bowie knife in hand, shoved her aside, jumped onto her father’s bed and began stabbing William Seward in the face and neck. 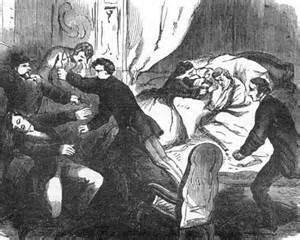 His murderous motions were so violent that he knocked Seward off the bed onto the floor. Newspaper illustration of the attack on Seward. grabbing him and wrestling him away from Seward. Fanny’s other brother, Augustus, awakened by her screams, joined Robinson in an attempt to subdue the violent Powell, who pushed them aside and ran down the stairs and out of the house, stabbing an innocent messenger at the door. 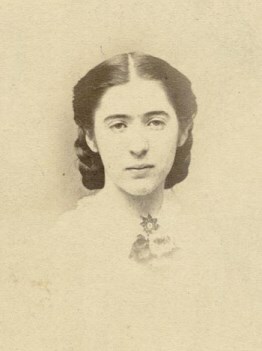 Fanny Seward tended her ailing father. She died of tuberculosis a year and a half later. “I remember running back, crying out ‘Where’s Father,’ seeing the empty bed. At the side I found what I thought was a pile of bedclothes – then I knew that it was Father. I remember that Robinson came instantly, and, lifting him, said his heart still beat – and he, without aid, laid him on the bed. Notwithstanding his own injuries Robinson stood faithfully at Father’s side, on the right hand. I did not know what should be done. Robinson told me everything – about staunching the blood with cloths and water. He applied them on the right side, and I, kneeling on the bed, on the left, put them on a wound on that side of the neck. 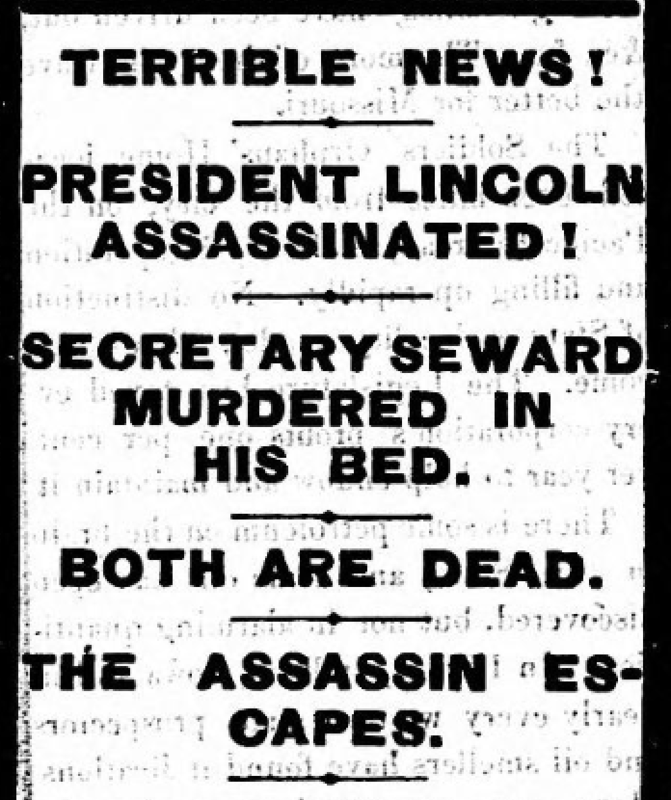 Newspaper headline mistakenly reporting Seward as dead. It turned out that Seward’s metal neck brace had taken the brunt of the stabbing, saving his life. 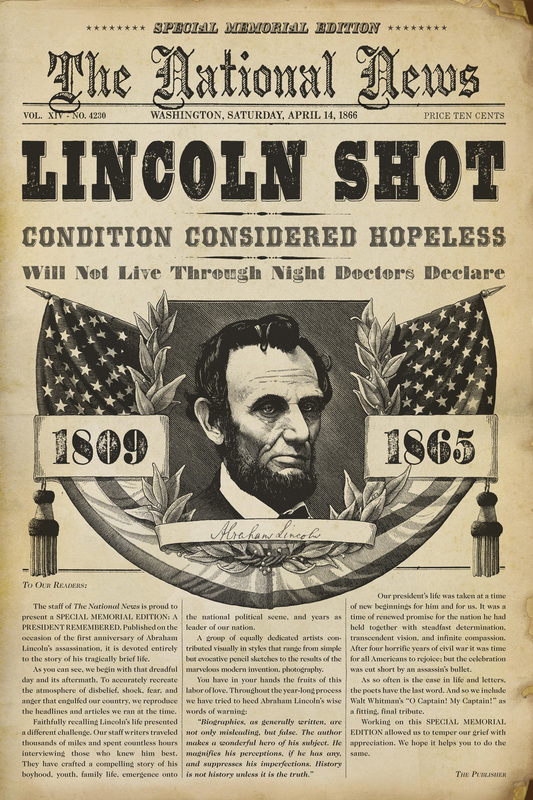 Magazine illustration of the assassination of President Abraham Lincoln. 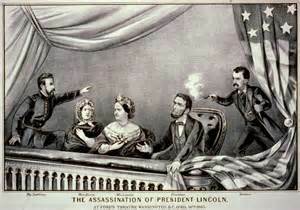 Confederate plotter John Wilkes Booth had convinced Lewis Powell to assassinate Secretary of State William Seward, while Booth himself, two blocks away, climbed the stairway to the Presidential Box at Ford’s Theatre and shot President Abraham Lincoln in the back of his head with a single bullet. And what was accomplished by all this violence and murder? The Confederacy still lost the war; and without the steadying hand of Lincoln, the government treated the defeated South far more harshly than Lincoln would have. Reconstruction of the South became far more difficult and took longer than anyone could have imagined. The violence of April 14, 1865 accomplished nothing at all for the perpetrators and, in fact, harmed their friends and allies. PS: We know of these events from the writings of those, who were eyewitnesses to them. Fanny Seward considered herself a writer and kept a detailed diary, which has been preserved. Trudy Krisher has compiled an edited version of the diaries under the title “Fanny Seward: A Life,” published by Syracuse University Press.